This 13th century Byzantine fresco of the Raska School is from the Moraca Monastery in Montenegro. 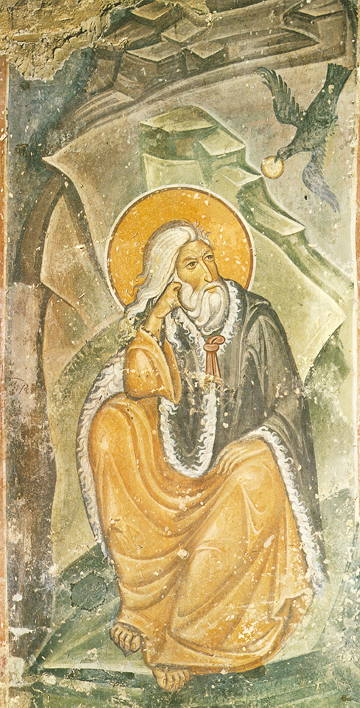 In it we see the Holy Prophet Elias (Elijah) seated in a cave with his mantle over his upper body. He looks both upward and inward to see the raven that God has sent to feed him twice a day while he is in the wilderness hiding from King Ahab, who wished to kill him. The Prophet Elias was sent by God to admonish the king and his evil pagan wife, Jezebel, because they worshiped idols and allowed the pagan priests and prophets of Ba’al to have prominence and honor in the Kingdom of Israel. King Ahab and Jezebel resisted God’s corrections and so they set in motion the very things that would end in their miserable deaths, where the dogs would lick the blood of their remains before burial. We, too, are called to repentance and correction for the evil deeds we have done and the evil thoughts of our hearts. If we will repent sincerely and leave such evil, God will bless us as we return humbly to Him and seek His forgiveness. Each person is precious to the Lord of Life Who created them. Let us humbly repent today.